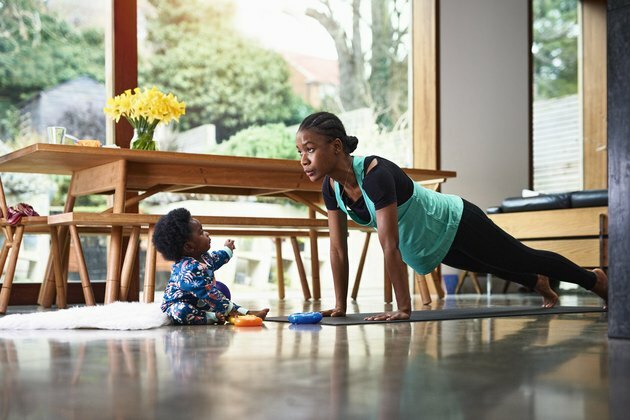 There's a lot to love about at-home workouts: They're affordable, convenient and accessible to all fitness levels — beginners included. However, it can be a bit tougher to avoid distractions (phone, email, kids, pets) at home than at the gym. If this is you, there are steps you can take to make sure you stay on track. If you can, set up a small workout space that's enjoyable to be in. "If you dread the space you're working out in, you're less likely to be consistent," says Hannah Davis, CSCS, owner of Body By Hannah and creator of BBH.Fit online training studio. She suggests filling the area with fun decor, like signs featuring your favorite positive mantras, colors you like and a quirky exercise mat. Also, if you plan on doing a lot of at-home workouts, consider investing in a few key pieces of equipment, such as a resistance bands, mini bands (resistance band loops) and two or three sets of dumbbells of varying weights. Eliminate distractions as much as possible by activating your phone's do not disturb feature, asking your family not to bother you and shutting the door to your workout space (if possible). Finally, always go into your home workouts with the same amount of planning as if you were going to the gym. "Knowing what to do and in what order to do it is a must to make sure you get an effective workout in your own home," says Amanda Dale, ACE-certified personal trainer and Precision Nutrition-certified nutritionist. Keep in mind that you'll have to take special safety precautions if you're working out at home — especially if no one else is around. 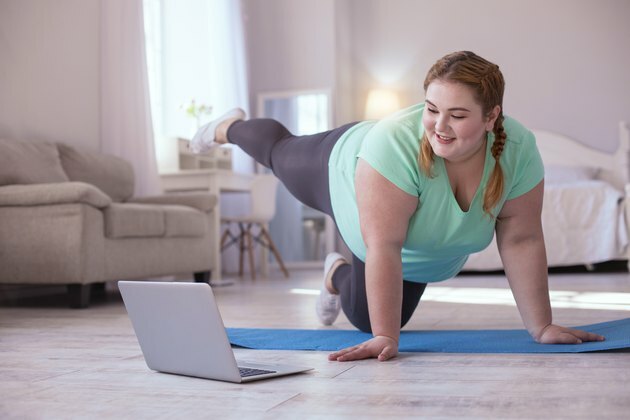 First, make sure you have a safe, open space to work out in, and that any equipment you're using (such as a chair or bench) is sturdy and can support your body weight, Dale says. Also, be mindful of the surface you're exercising on. "If you progress to any kind of plyometric movements, I would not recommend doing those on concrete garage flooring," Davis says. Wood or carpeted floors are kinder on your joints. On the other hand, some exercises (ex. jumping jacks, lateral hops) can sometimes be risky on "sticky" flooring like carpet, so you might want to use a mat or other smooth surface. Finally, pay attention to how you feel during exercise. "If something causes a sharp pain, your form may off," says celebrity trainer Mike Donavanik, CSCS, creator of the Sweat Factor workout app. He recommends seeking professional help or watching videos to nail proper form. And if you can, watch yourself perform the exercises in front of a mirror. "Your form will improve dramatically," Donavanik says. If you still feel pain when doing a particular exercise, you may have an underlying issue. Skip that move for the time being and get help from a doctor or physical therapist. To get you started, we asked three personal trainers for their favorite beginner workouts you can do at home (or anywhere, really). Pick one of the following five workouts and get to it. Work every muscle from head to toe with this beginner-friendly workout from personal trainer Amanda Dale. Warm-Up: Do the following circuit two times. Circuit 1: Complete the following four exercises for 20 reps. Repeat the same circuit for 16 reps each, then 12, and finally eight reps for a total of four sets. Circuit 2: Set a timer to go off every minute on the minute for six minutes. During each odd-numbered minute (1, 3, 5), try to complete 30 crunches, and during each even-numbered minute (2, 4, 6), aim to hold a plank until the timer goes off. Full-body workouts are generally great for beginners, as they give you more time to focus on form without fatiguing your muscles too much. Try this one from personal trainer Hannah Davis. Perform each superset for three rounds, and do each exercise for 15 reps (or 15 reps per side). For your third full-body workout in this series, personal trainer Mike Donavanik offers this workout you can do with or without dumbbells. Do the following exercises for three rounds total. To switch things up and focus on your lower body, Dale created this routine. Circuit 1: Complete the following four exercises for 20 reps. Repeat the same exercises for 16 reps each, then 12, and finally eight reps for a total of four sets. Circuit 2: Set a timer to go off every minute on the minute for six minutes. During each odd-numbered minute (1, 3, 5), try to complete 15 squat jumps, and during each even-numbered minute (2, 4, 6), aim to hold chair pose against the wall until the timer goes off. Here's one more lower-body workout; this time from from Donavanik. Because who doesn't want a bootylicious backside and strong legs? Go through the following exercises for three sets of 12 to 15 reps each. And let's not forget your upper body! Your arms, shoulders, chest and upper back need some love, too. Here's a 15-minute routine from Dale. Circuit 1: Complete the following four exercises for 15 reps. Repeat the same exercises for 12 reps each, then nine, and finally six reps for a total of four sets. Circuit 2: Set a timer to go off every minute on the minute for six minutes. During each odd-numbered minute (1, 3, 5), try to complete 5 burpees (take out push-ups and/or jump if needed), and during each even-numbered minute (2, 4, 6), aim to hold a high plank until the timer goes off.